Ordinary number signatures Serm-Pisoot UNC about 165 - 175 baht. Solid number include serial code xxxxxxx signatures Sommai-Pisoot UNC about 88,000 baht. 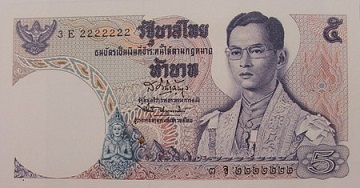 The 11th series banknotes were the first banknotes that were printed by Thailand banknote printing works. At the begining, the designing and plate engraving were made by foreign expert. 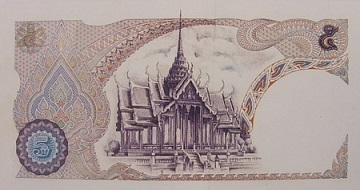 This 5 baht banknote was issued on June 24th, 1969. The main color of the banknote is purple. The main object is the image of King Rama 9 in full regalia. The main object is the image of the Arphonpimok Prasart Pavilion that located at the boundary of Dusit Maha Prasart throne hall. Raised ink, image watermark, security thread.